the entire genre of romance comics, broke up in the 1950s, when comics sales were at their lowest ebb to date. 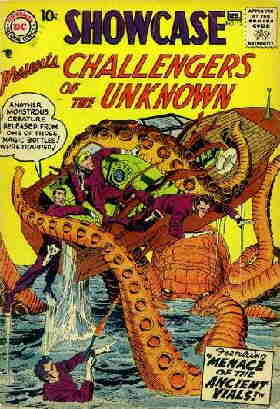 The first thing the newly-partnerless Kirby did was Challengers of the Unknown. It was a leftover concept from the Simon & Kirby shop, but as published by DC Comics in 1957, it looked like pure Kirby. The Challengers were Ace Morgan (crackerjack test pilot), Red Ryan (mountain climber and all-'round daredevil), Rocky Davis (heavyweight boxing champ) and Prof Haley (scientist specializing in underwater exploration). In Showcase #6 (Jan-Feb 1957), where the series was first tried out before receiving its own comic, the four barely survived the crash of a small aircraft, and thereafter considered themselves to be living on borrowed time. They decided to devote their lives to adventurous do-gooding, heedless of danger because after all, they should have been dead already. The foursome appeared in three more issues of Showcase (#s 7, 11 and 12), then moved out into their own comic, with its first issue dated April-May, 1958. Their series was unusual in that it was the first since The Justice Society of America in which a single story often filled the entire comic — and in the JSA's case, the story was usually divided into semi-autonomous chapters, to give each character a place to star. Today, single-story comics are the norm — in fact, most stories sprawl over several issues. But back then, using a whole comic to tell one story was an innovation. It was kind of like a dry run for Kirby's later Fantastic Four. And then, suddenly, it all — well, it all continued, actually, but without Kirby to drive the stories, it was as if the characters were just going through a set of routines. Kirby had left for Marvel Comics and new projects of his own, and wouldn't return to DC until 1970. The Challengers did well enough under the editorship of Jack Schiff, the man who had guided the Batman line since the 1940s. For the next several years, Bob Brown (Space Ranger, Doom Patrol) did a fine job illustrating scripts by Schiff's writing stable, including Bob Haney (Metamorpho), Arnold Drake (Deadman) and others, but the series no longer reached Kirby's stellar heights. Under a succession of creative teams, it lasted until 1970 as a regular publication, then sputtered through the '70s in fits and starts. The characters lay dormant through most of the 1980s, but still managed a guest appearance here and there during that decade. In the 1990s, several attempts were made to revive them, with variations on the basic premise — including one in which they were nothing but a set of franchised characters (imagine that!). Most recently, they've been treated as a period piece, i.e., exactly as they were in the beginning including the time frame — only now, the "1950s" they operate in consists of that decade as seen from the present, and not the '50s as they were when Kirby was living them. Text ©2000-04 Donald D. Markstein. Art © DC Comics.